Top Tots is a popular day nursery based on Queen Street and at the Mountbatten Centre, Portsmouth. Are you returning to work and looking for 'OUTSTANDING' care and education for your baby? We offer full time care from as low as £170 per week inclusive of nappies/wipes & snacks! Book your visit to look around our nursery today! 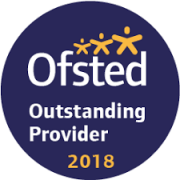 Judged by Ofsted in March 2018 as 'OUTSTANDING IN ALL AREAS' Top Tots Nursery provides an 'OUTSTANDING' nurturing and caring environment for children aged from 3 months up to 5 years old. Top Tots Day Nursery Ltd first opened in 2005 to provide quality day nursery and pre-school services to babies, toddlers and pre-school aged children in the local community as well as Naval families living or working in Portsmouth. Our aim is to offer OUTSTANDING childcare services at an affordable price, while ensuring all children are happy and thrive to their full potential while feeling safe and secure. We are open Monday to Friday from 7.30am - 6pm, all year round except bank holidays and are closed for 2 weeks over Christmas. Childcare is available from only £135pw (*FREE 15 hours per week for 2,3 and 4 year olds). Further details on our nursery fees can be found here. The first Top Tots Nursery site is based inside The John Pound Community Centre on Queen Street, Portsmouth, PO1 3HN - 02392 892037 just a short walk from the Gosport/Isle of Wight Ferry entrance and main bus routes of Portsmouth. We also have the HMS Nelson entrance within 5 mins walking distance of our front door. The second Top Tots Nursery site is based in the Mountbatten Centre, Hilsea, Portsmouth PO2 9QA - 02392 695 265. For all enquries about our nursery or to arrange a visit, please get in touch on 02392 892 027 or 07795 073 231. We hope to welcome you and your child soon.